Lisa Smith is a compassionate and experienced Massachusetts divorce lawyer. She recognizes how each divorce requires special attention and a “customized solution” to help her clients use the divorce process to create a plan for future goals. She carefully listens to her clients then provides legal advice and information about their divorce options. Lisa’s success is based on her ability to offer her clients a variety of strategies to resolve their problems. She is trained in Collaborative Law, as a Mediator, a Mediation to Stay Married attorney, a Limited Assistance Representation Attorney and a Parenting Coordinator. Lisa is one of 28 mediators in Massachusetts to have the distinction of being approved as a Certified Mediator by the Massachusetts Council on Family Mediation (MCFM). This designation is reserved for individuals with significant mediation experience, advanced training, and education. 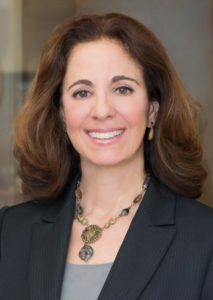 Lisa was also recently recognized as one of Boston’s Top Rated Lawyers of 2014. Her dedication to help people feel healthy, hopeful and protected as they approach divorce has motivated Lisa to work on programs to increase the availability of Collaborative Law to Massachusetts residents. In that regard, Lisa served as the President of the Massachusetts Collaborative Law Council (MCLC), and as Program Chair for numerous state-wide trainings and conferences on Collaborative Law for MCLC and Suffolk University Law School Advanced Legal Studies. Lisa has presented at several workshops including one at the annual conference for the New England Association for Conflict Resolution (NE-ACR), Annual Institute of Massachusetts Council on Family Mediation (MCFM) and she authored a chapter in a New England publication on Collaborative Divorce which was published in January 2014. For over 25 years, Lisa has been a lawyer in Massachusetts. She graduated from Brown University and received her law degree from the University of Colorado School of Law after attending her third-year as a visiting JD candidate at Boston College Law School. Lisa is a long-time resident of Wellesley and represents clients in Wellesley, Natick, the surrounding communities and Eastern Massachusetts.